Description - Our mega rolled rubber flooring is ideal for extreme users such as Olympic motion weight lifters and power lifters. 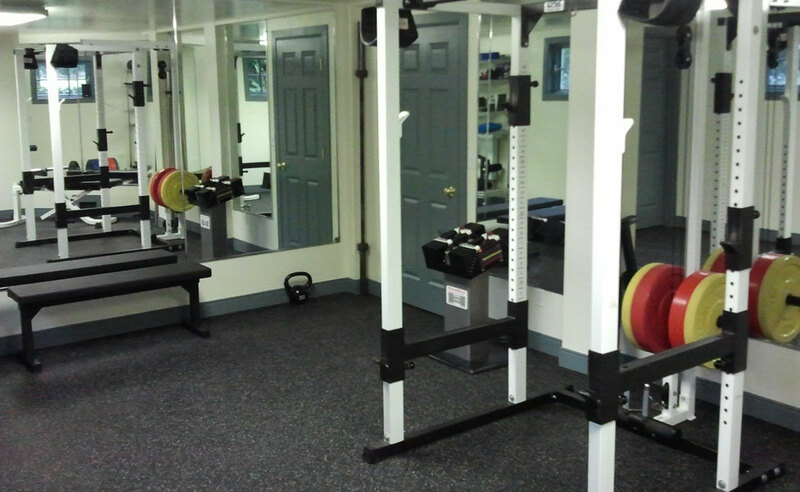 It is our most durable rolled rubber flooring solution and is designed specifically for areas where heavy free weights are used. This flooring can be found in many power lifting and body building gyms around the country and was designed for the most serious and demanding users. Combine that with our industry leading 5 year warranty on all of our rubber flooring products and it’s hard to go wrong when picking mega rubber rolls as your flooring choice. All of our mega rubber rolls are also precisely machine cut to guarantee a uniform and easy to install rubber flooring surface at discount level prices. These rubber rolls are also safe to use both indoors and out. Length – The rubber rolls are custom cut to your desired length free of charge provided that each roll length is 15’ long or longer and in whole foot increments such as 15’, 16’, 17’, etc. You will normally receive an extra few inches on each roll. This allows for a quick and easy installation. Weight – 3.0 Lbs. per square foot. Recommended Uses –Mega rubber roll flooring can be found being used successfully in commercial weight rooms and as body building gym flooring. These rolls have even been used in Olympic training facilities in order to provide a safe, non slip flooring surface with extreme durability and shock absorption capabilities in order to protect sub floors from dropped weights. The mega rolls are also a popular choice for use around ice skating rinks where people may end up walking on the flooring with ice skate blades and in locations such as major league dugouts where metal spikes are commonly used. Custom cut to fit your needs. Available in 16 quick ship colors. We need to abut your 1/2" mega roll product into a 1" thick floor. Do you supply a transition strip/trim piece that can be added on top of the 1/2" product to bevel up to the higher floor? I am an architect - how do we specify the trim piece? We do not have vinyl or rubber transitions that would work for your installation, but there are solutions to your issue. One could be placing a rubber underlay underneath your rubber flooring to get it to the same height as your tile. Another solution would be to get an unfinished reducer and stain or paint it to a color that is similar to either the rubber or the tile. You could also use shims at the point where the two floors meet to get them to the same level and then either use a transition piece or leave the joint as is. The transition piece you would need there would be a T-mold. Could the 1/2" or 3/8" be used in a garage to park cars on and can it take chemicals (oil)? You can park a car on our 1/2" and 3/8" rubber rolls, but if your car leaks oil, the roll will start to break down over time. Most other vehicle chemicals will not affect the flooring in this manner. I want to install these in my daughters indoor play area but was wondering if these mats pose any sort of health hazard. Is it safe to have my daughter in close proximity of these mats for several hours a day given the chemicals they contain? Our 1/2" Mega Rubber Rolls are very safe and can be installed in your daughter's play area. The rubber flooring is cleaned thoroughly to ensure that any dirt, debris, and chemicals are properly removed before making our rubber flooring. If you would like product testing for our Mega Rubber Rolls, please feel free to contact one of our flooring heroes and they would be more than happy to present you any documentation you needed. I need to know how large in diameter the 1/2" rolled rubber 50' lengths are? The rolled diameter of a 50' 1/2" roll is 20". Is the 1/2 mega roll firm enough to use over fairly soft carpet for a treadmill? I bought a mat from local fitness store, think it was 1/4 or 3/8. It bends quite a bit when I walk on it on my carpet, and I'm not that heavy. Have about 400 lb commercial treadmill on it and its barely better then just being on the carpet alone. Our 1/2" Mega Rubber Rolls perform best over commercial grade low pile carpet. Since your wanting to use this roll as a mat, the weight of the treadmill should keep the roll solid underneath the treadmill. There may be some bending due to the carpet being a high pile carpet, but there shouldn't be much. This roll should perform better than the thinner mats you have been using. Other products that you could consider that perform better over high pile carpets are our 1" Monster Tiles and our 1" Sports Play Tiles. Great product – easy to measure and order. Installation was a breeze. Two sided tape is the way to go! Not the cleanest picture – but we just drilled the holes for the gym rack. Great product - very heavy duty. Discovered about 1/3 of the way into my project that you can use the cardboard tubes the product ships around to help cut the rubber. Score 2-3 times with a utility knife (frequently changing blades) using a t-square as shown in the rubber flooring inc videos but then, for these very thick ones, position the tube underneath where you are cutting and with one hand behind (out of the way) of the blade stroke, spread the rubber over the cardboard tube. This way your knife isn't also "fighting" the friction of the 1/2" rubber. Works great! After scouring the internet extensively for gym flooring options, I decided on rubberflooringinc, as its website had the most informative detail on flooring, and the quality of the reviews seemed the most consistent and highest. Moreover, it seemed that rubberflooringinc was the only one to distinguish among the different types of recycled rubber, which gave me confidence that it used the highest quality recycled rubber available. This was important, since the better the rubber, the less the smell. There was one website that offered virgin rubber mats, but their cost was prohibitively expensive. The phone representative at rubberflooringinc that helped me with sizing, and placed my order was courteous and knowledgable. Nearly a week earlier than scheduled, the delivery driver called me to schedule a convenient time, and I asked if he could place the mats on my driveway, as opposed to the sidewalk. My 5 rolls of 4' x 11' mega rubber arrived perfectly, strapped together, piled on top of a wood pallet, all 700 something pounds, placed nicely on my driveway/walkway, well in from the street. I understood the rolls were heavy, but when you look at them, you just can't imagine how heavy they really are until you try to lift them. The rolls were all cut slightly larger than my 4 x 11' spec, which I guess is good, but I measured my 11' x 20' room exactly, and didn't want to cut them very much. I laid the first 4 rolls down easily, and the side edges were all machine cut and perfect, so they lined up seamlessly, which was very cool. But they all were about 2 ft longer than my specs, and I realized it is not easy to cut the ends across, since the roll is so thick, it doesn't fold into the corner/edge right angle, so you have to approximate the cutting point. They also can scrape your walls black if you are not careful about letting the excess length down gently when laying it down. In addition, be advised that each roll was about 1-2 inches wider than spec as well, which left one section that needed to be cut lengthwise. You definitely need a straight edge and a solid cutter to make your cuts. The actual cutting is easy. For the lengthwise cut on the final roll (call it #5), I simply laid it down along the outer wall, with only an imperceptible space to account for any overlap, then I laid the excess width on top of mat #4 next to it. The mega roll is so heavy and thick, it lays pretty flat on the other mat, so I placed the straight edge down on mat #4 right up against the overlapped edge of mat #5, and cut a straight line into mat #4 (the one underneath). I then removed the thin cut portion of mat #4, and pushed the edge of mat #5 down into the cut side of mat #4, and it fit almost perfectly. If anything, it will be a little too tight, so you can use the imperceptible space you left between mat #5 and the wall to level that out. It all should end up looking seamless as long as you made a straight cut. The matting had an very minor rubbber smell, not unpleasant at all for a few days, and I am very sensitive to bad smells. I didn't really even "air it out", and at this point, a couple of weeks afterwards, there is almost no smell at all. The rubber feels great under foot, feels indestructible, with just the right amount of give and resilience for jumping activities. 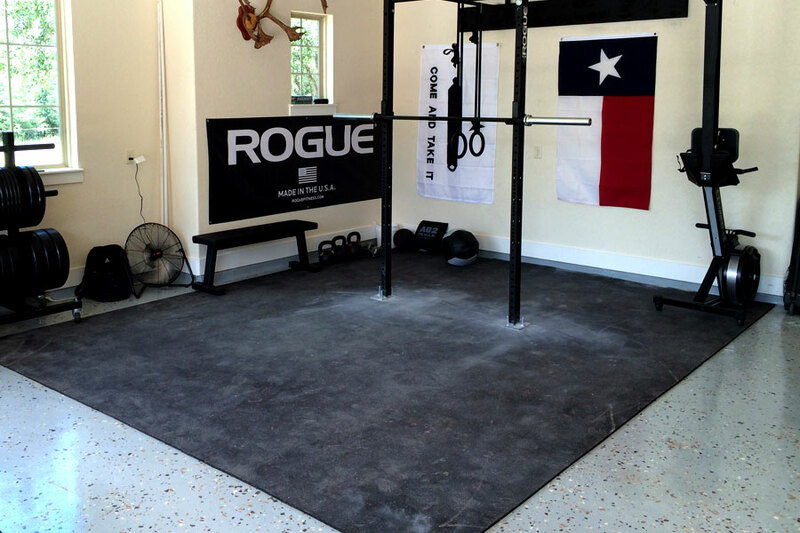 I cannot express how happy I am with both rubberflooringinc, the company, and the quality of my mega roll gym floor. 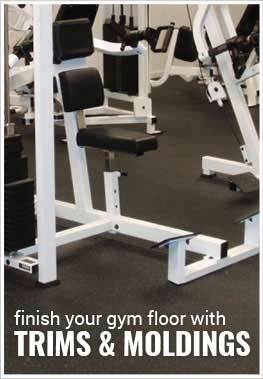 If you are looking for the perfect gym flooring, there is no need to look any further. The only things you have to be prepared for, are the cutting, and the heavy weight of the rolls.